Private label Pét-Nat and irreverent wine temples lay just 100 miles north of Seattle. 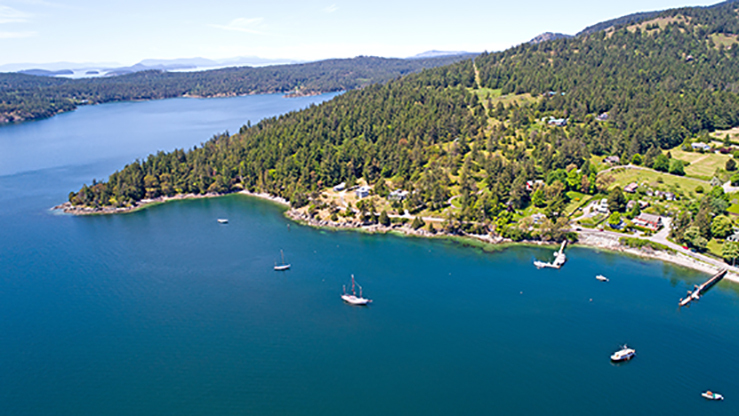 Orcas Island has always drawn visitors with its monumental views, lush parks, and utterly relaxing island vibe. Now, with new wine bars, tasting menus, and sommelier services, the ever-growing food and beverage scene has increasingly become the island’s siren song. Once a place to get away from the hustle of urban life, many of Orcas Island’s best spots are now integrating city luxuries into their DNA—in a decidedly island way. One of the most anticipated openings on Orcas Island over the last year was Champagne Champagne, an “irreverent natural wine temple by the sea.” One look out of the restaurant’s back windows and you’ll quickly understand the use of the word “temple.” Chiseled into the rock side of southern Orcas, Champagne Champagne provides a panoramic view of the Salish Sea, Shaw Island, and passing San Juan ferries. This little restaurant is the brainchild of Orcas Island native Amelia Carver and her fiancé Brian Crum. The pair returned to Orcas with the desire to showcase the incredible bounty of the San Juan Islands and create an engaging, safe place for people learn about natural wine. Champagne Champagne is a celebration of things the couple loves to eat and drink. That means Gewurztraminer from Oregon’s Analemma Winery, oysters on the half shell, Cru Beaujolais from Juliénas, fried smelts, 12-ounce cans of Montucky Cold Snacks, and endless crudos, ceviches, and tatares. Champagne Champagne also boasts an adjoining wine shop called the Bodega, which sits somewhere squarely between a typical city corner store and your dream wine cellar. The street-facing shop is small, but mighty, packed with beautiful, value-driven organic and natural wine and beer from small producers and farmers. A one-minute walk from the ferry terminal, the Bodega is a welcomed place to spend time while waiting for the boat home. Orcas native and sommelier Cole Sisson returned to his homeland to open Doe Bay Wine Company after traveling the world slinging wine. Along the way, he met his wife, Stephanie Sisson, an industry professional with a passion for wine training and education. Together, they run the East Sound wine shop. Doe Bay Wine Co.’s selection is world-class, with plenty of traditional bottles, high-quality budget options, local wineries, and even the couple’s own foray into wine—the Orcas Project (the Oregon-grown Grenache Pét-Nat is a must). A killer selection of wine is a given for any bottle shop that wants to succeed, and Doe Bay does not disappoint. However, what truly sets the shop apart is the couple’s passion for education, which seeps into every offering they have. Throughout the summer, they host a nightly wine tasting for 12 guests from 7:15-8:00PM. The themes change, with options ranging from “Top Grapes of Southern Italy” to “Boutique Producers of the Northwest.” These classes are a chance to explore new regions, ask questions, and bring home interesting bottles. Beyond regular tastings, at any given time of the year, Cole and Stephanie offer trip planning and tours of Washington wine country, wine cellar procurement, delivery throughout the island (including to your tent at Moran State Park), wine dinners, and regular tastings with local producers. What started as one obsession-worthy, crowd-inducing pizza place has now become two of the best restaurants on the Island. Both run by Food & Wine’s 2017 Best New Chef Jay Blackinton (who we featured in Seattle magazine in the June 2015 issue), Hogstone’s Wood Oven operates (mostly) from the backyard patio, while Aelder offers multiple course tasting menus from the small interior and open kitchen. While the food differs from one establishment to the next, what both restaurants share the same passion for interesting, highly allocated wine. Constantly evolving, mirroring the food that has made Blackinton famous, the wine list is always entertaining, enlightening, and food-friendly. Here in the Pacific Northwest, it’s easy to find wine lists that only feature local wineries—and with Blackinton’s focus on hyper local cuisine, one might expect to only find wine made within the state’s borders. However, Hogstone and Aelder both boast some of the best international selections you can find in all of Washington—mixed with some American beauties, of course. Over the past year, wines have included Stanko Radikon’s decade-old orange wine from Friuli, Jean-François Ganevat’s Jura selections, apple wines from Fable Farm Fermentory in Barnard, Vermont, Brooks Winery Oregon Pinot Noir, and the Loire’s incredibly culty Clos Rougeard. Reservations at Aelder are now live, and it opens for the season April 13. The food coming from Blackinton’s kitchen is reason enough to make the trek to Orcas, but there is so much more to love than just what happens in that wood oven. Go for the pizza; stay for the wine. We have reached that time of the year again that is all about getting together with family and sitting down to big, elaborate meals. And while we are supposed to be happy and celebrating, many people are simply thankful to get through the holidays in one piece. Why must the holidays be so stressful? Good news, they don’t have to be! Want to know the easiest way to bypass the stress: have a plan. Simple right? Not exactly, but it’s amazing how much a thorough plan can transform your holiday season. With Thanksgiving being only a week away, let’s go through the next week; breaking up preparation tasks to make it all feel less daunting. Collect your recipes and create a shopping list. Still don’t know exactly what you’re making for the big feast? Time to get that sorted. Go through as many recipes as it takes, but remember, not every dish needs to be fancy and complicated. Sometimes the simplest option is the best. Figure out what needs to get eaten over the next week to create as much storage in your fridge as possible. Are there items that can get used in some of your recipes? Are there things that simply need to get tossed? Keep in mind that you will want to maximize the amount of storage containers you have on hand. This will make life much easier as you move the through the week. Dedicate this last weekend to preparations. This is your time to do the shopping. Hit the market early, and give yourself plenty of time to shop. Chances are you have a big list, and it’s no fun trying to get everything in your basket while racing the clock. And while you are out, consider picking up extra storage containers that you can fill with leftovers and send home with guests. 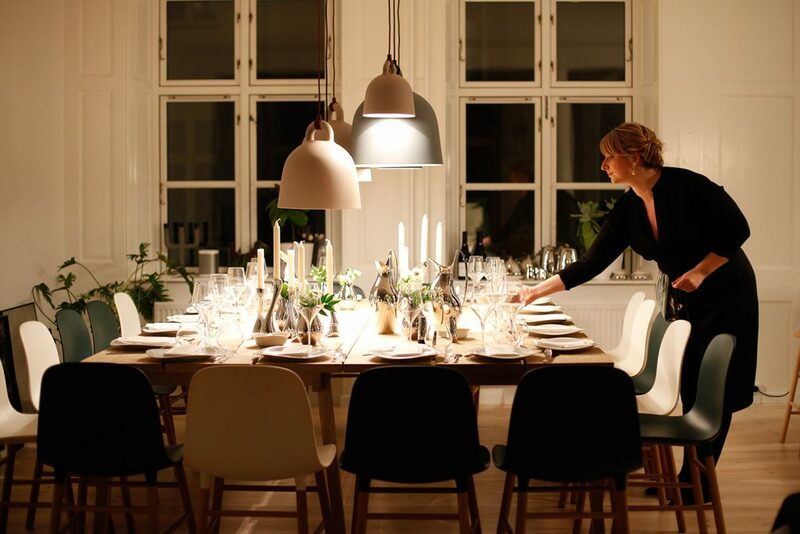 If you are hosting, you will want your home to sparkle and shine for guests coming to visit. Take the time to do a thorough clean this weekend, and prepare spare rooms with clean linens and supplies. It’s easy to do some touch up cleaning right before everyone shows up, but doing most of the chores now will save on time and stress later in the week. Even if you are going away for the holidays, having a clean house to come home to is a nice treat after a busy weekend. There is plenty of food that can be cooked and assembled ahead of time, and the weekend is perfect for scratching the most time consuming of these off your list. For starters, make your pie crusts. Even if you make the filling later, having a crust ready to go is a huge relief. Pre-cook it and put it in the freezer until the night before. And if you want, cook the whole pie on Wednesday night so all you have to do is reheat on Thursday. Other great options for making ahead are the cranberry sauce, toasted nuts, stock for stuffing and casseroles. Also, if you are making your own bread for the stuffing, doing that over the weekend gives it plenty of time to dry out over the coming days. The less you have to take care of on the last few days before Thanksgiving the happier you will be on the day itself. For those of us with full time jobs, this is especially true. Still, taking care of a few small things will allow you more time to relax and visit with family on the big day. So, on the days leading up, after dinner of course, go ahead and pre-chop those vegetables that you will need for your side dishes. Take your turkey out of the freezer and get the brine on it a couple of days. Do a little extra tidying around the house and put some extra seasonal décor. Find a clear, designated area for drinks and appetizers, then set the dining room table for your guests (eating on the couch for a night or two is perfectly acceptable). All of this may seem like a lot to accomplish in the last week, but if you do it, you will thank yourself later. Thanksgiving is not about spending your whole day slaving away in the kitchen; it’s about having time to spend with the people you love. So plan ahead, stop stressing, and be thankful to have so many people who want to spend the day with you. 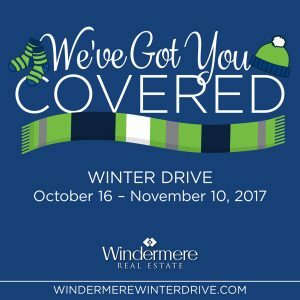 With the weather changing and winter rapidly approaching, Windermere Real Estate offices in Snohomish and King Counties are participating in the “We’ve Got You Covered” campaign; collecting cold weather gear for homeless youth in the city. While we are lucky to not have a large homeless population here on Orcas, there are still many people in our community who could use a helping hand. With this in mind, our office has decided to run a local version of this campaign. So from now until November 10th we are collecting warm socks, hats, scarves, mittens and gloves for youth in our community. Items will then be delivered to Orcas Family Resources, who has graciously agreed to help us with distribution. Thank you for helping us keep our community warm this winter! 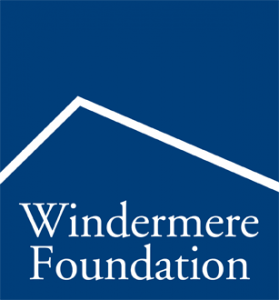 What is the Windermere Foundation? The Windermere Foundation was started in 1989 by the owners of Windermere Real Estate, which is based in Seattle. Since its inception, the Foundation has raised more than $33 million to support it’s mission: helping low income and homeless families. The Foundation began in Washington, but now has grown to serve the 10 western states. Currently, there are more than 40 major organizations that receive significant funding from the Foundation. These organizations provide emergency assistance, and youth and children’s programs. As part of the Windermere organization, each of our brokers donates a portion of their commission from every transaction to the Windermere Foundation. Each of us is proud to support the Foundation. A portion of the funds that we donate comes back to our office to enable us to donate directly to local organizations within our community that support the same cause as the Windermere Foundation: helping local families right here on Orcas. We have a local Foundation Representative, Elyse Van den Bosch, who works directly with the local non-profits to assist in their applications for funding. We have supported organizations such as the Funhouse, Orcas Family Connections, OPAL immediate housing needs, the Food Bank, and each of the various early childhood programs, to name just a few. In addition to our broker commission donations, our office has also coordinated various fundraising and volunteer activities to raise additional money for our local non-profits that assist families and children in need. There is nothing like stepping outside, taking a deep breath, and pulling your jacket just a little closer around yourself. I haven’t worn a jacket in months – oh the joys of summer. But I can’t resist the smile that emerges on my face as the goose bumps rise. Maybe it has to do with how fresh the air feels, maybe it’s because the island has made it through the summer rush, or maybe it simply has to do with the fact that I love getting to put on my beloved boots and sweaters again. Don’t get me wrong, I love summer as much as the next person. Sun and heat are two of my favorite things, but this summer was particularly dry for the San Juan Islands and I for one am tired of the color brown. For the last few months everything has just felt dusty and dirty – not something those of us from the great ‘north-wet’ are used to. I miss the green. And so, the return of the rain is something I welcome with open arms. There is also this miraculous slowdown that happens post-Labor Day. September is still a busy month on the islands, but nothing compared to July and August. It just has an entirely different feel. Now, not only is it easier to get on a ferry last minute, but going to Island Market is no longer a hassle, and everyone is so much more laid back. It’s as if the islands have been holding their breath for two months and are finally able to exhale. Locals stop and chat on the street again, without that wild look in their eyes that says, “I am going to lose it on the next person that asks what times the whales go by”. Yes, that is a common question, and no, the whales do not share their schedule with us bipeds, so please stop asking. After the breath of September, the islands start churning again, with all kinds of activities suited to the shift of seasons. Savor the San Juans runs from the first day of fall through the first week of November and brings with it many events and opportunities to enjoy the flavors of island life. The Orcas Island Film Festival runs the first weekend in October and has become quite the affair over the last few years, bringing in award winning films from around the world. There are also a slew of lectures, classes, and farm tours that happen through the end of the year. And the holidays out here, truly magical. As the days begin to cool and the darkness stretches longer than the day, all I can think about is being curled up on my couch with my dog; a fire burning in my woodstove; mouthwatering smells emanating from the slow cooker; hot apple cider warming on the stove. Fresh pressed cider is everywhere on the islands right now and will be the majority of what I drink for the next couple of months, interspersed with some hot chocolate and homemade hot buttered rum. Oh yes, the season of coziness is upon us. 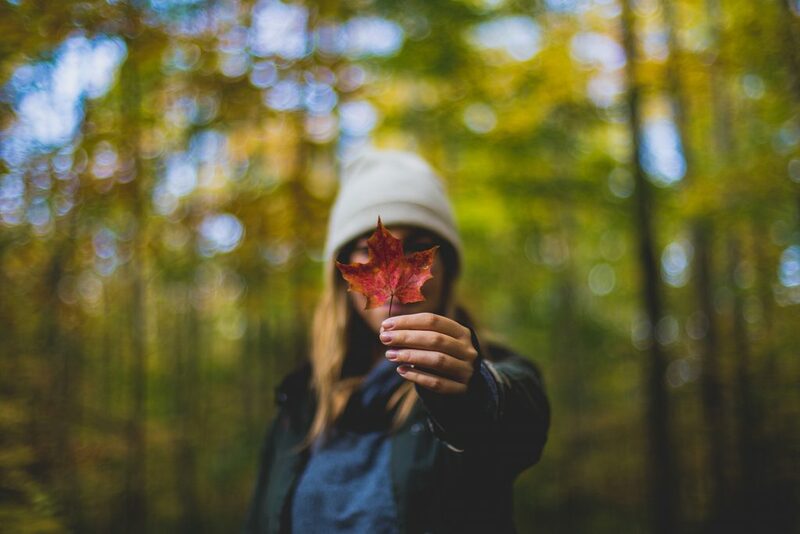 Welcome back autumn. We made it past July 5th and summer is in full swing here in the Pacific Northwest! For many of us, this is the time when we not only get out of the house, but get out of the town where we live to enjoy a summer vacation. While I am a big proponent of hitting the road and leaving my troubles behind me, there are a few things that need to be done in advance of any travels in order for me to be able to truly relax and let go. Before I can put myself in vacation mode, I must first put my house in vacation mode. So, here is my pre-departure checklist which allows that laissez-faire feeling to remain long after my return home. I know, there is already tons to do before you leave; how are you also supposed to find time to clean the house? You’re stressed about getting packed on time, making sure all your travel arrangements are made, reservations are set – but trust me, there is nothing like coming back to a shiny, fresh home. Your future self will thank you for this gift. Clean out the fridge/freezer – no one likes coming home to the smell of rotting food. Take out the garbage & recycling – again, no smell is a good smell. Leave cleaner in the toilets – do I have to repeat myself about smells? Do all the laundry – clothes from the trip can go right in the basket when you get back. And since it will not be full, you can put off throwing a load in the wash for a while. Put fresh sheets on the bed – after sleeping in strange places it’s nice to not have to worry about what’s under the covers. Whether you are taking off for a week or a month, it is worth eliminating all need for worry about the state of your home. If no one is going to be there, then no one is going to need to use anything that is plumbed or wired. And let’s face it, there is nothing worse than coming home to an unnatural home disaster. Unplug the small things – you’re cleaning your house anyway right? So why don’t you put that curling iron back in the bathroom drawer and wind that cord around the toaster. It’s tidy and safety all in one go! Lower your bills – turn the water heater to “vacation mode” and turn off your thermostat. No need to have these running while you are away; plus, that’s a few more dollars allotted to the travel funds. No pools in the house – turn off water valves to major appliances like your washing machine, dish washer, etc. Better yet, if you can, turn the water off completely via the main shut off valve. Check the weather – if extreme weather is forecast for the time you are away, make sure your house and yard are ready to endure it. We all know there are people in this world who feel the need to make giant messes and take things that don’t belong to them. And where better to partake in these activities then in a house that is currently unoccupied? Oh wait, maybe someone is home. Never mind, let’s try somewhere else. Lights on, lights off? – I’m the kind of person that turns a light off every time I leave a room, but in this case, it may be worth leaving a couple on. Flood lights and interior lights on timers help your home maintain that lived in feel. Business as usual – don’t make it obvious that no one is home. People do not normally leave all the curtains closed up tight (unless you a serious recluse… or a vampire). Mail call – check in with your local post office before you leave and have them hold your deliveries until you return. Or have someone you trust pick it up for you. Don’t forget the paper. Landscaping matters – if you are planning an extended trip, hire someone to come mow your lawn and water your plants. A neglected yard is a sure sign that no one is around. What spare key? – if you are in the habit of leaving a key hidden around the outside of your home, please remove it and give it to a friend or neighbor in case of emergency. All in all, common sense will go a long way in helping you prepare your home for vacancy. If there is something that could be a potential hazard, take care of it before you leave. The less you have to worry about, the more you get to enjoy your time away from the every day. Fourth of July weekend on Orcas Island – Wow what a show! This is a great annual fundraiser to support the Eastsound Volunteer Firefighters and EMT’s. They will be serving up their special recipe pancakes, sausage, eggs, and beverages. Cost is $8 per adult and $5 per child with kids under 5 years eating for free. Happening every Saturday, all summer long on the Village Green. This is a great place to grab produce and flowers from island farms, check out local artists, and grab some lunch. This celebration of island history, sponsored by the Orcas Island Historical Museum, takes place on the Village Green in conjunction with the Farmers Market. There will be a pie booth, hot dog stand, and beer garden. Then at 1:30 the local Harvey Family will put on a logging show. Islanders from local businesses and organizations will be dressing up as all manner of animals and parading through Eastsound Village. Parades on this island are a one-of-a-kind experience, so you will not want to miss this. The Lion’s Club is involved in many projects across the island, and this event raises funds so they can continue with their great community service. Served alongside the salmon is a baked potato, coleslaw, roll, beverages, and the option of adding on apple crisp. Cost is $18 per adult and $12 for children up to 12 years. Gather down on the docks at the Deer Harbor Marina to hear some music and enjoy the light show. This is a very popular event, so be sure and get there extra early. Work off some of those calories from the weekend with a race around the Eastsound area. All ages and abilities are welcome with the kids 1K race beginning at 10am. Registration is $35 per adult and $10 per child. All proceeds benefit the Funhouse Commons, who provides many programs for island kids. Hosted at Orcasong Farm, this is an evening of music, education, food, and fun. From 3-6pm there is a workshop titled “Music as Medicine” and from 6-10pm there will be a potluck dinner and live music provided by The Living Arrows. Cost is $10-$40. Head on into town in the early evening to hear the Community Band play before the big show. Then find a spot on the beach to kick back and enjoy the fireworks. It’s GiveOrcas month here on the island and everyone is feeling the love. Locals skip through the streets of Eastsound hugging, laughing, and catching up on the latest gossip. Okay, so maybe it’s not quite as cheesy as one of those quaint villages from your childhood storybooks; life is not all sunshine and rainbows after all. But while there isn’t a whole lot of skipping going on, the hugging, laughing, and gossiping are pretty on par. And this month in particular we are reminded of why we are so lucky to live here: we are a community that cares. 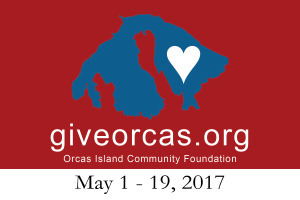 The GiveOrcas campaign is run by the Orcas Island Community Foundation (OICF), whose mission is “to foster philanthropy to enhance and preserve the quality of life on Orcas Island”. They are a public foundation that fosters community collaboration in order to create a strong financial base for supporting local services and organizations. OICF’s role has become increasingly important on this island which somehow supports a huge number of nonprofits – about 1 per 45 residents. This number may seem insane to some, or most of us, but it’s important to remember that Orcas has no real form of government since there is no incorporated town. As such, these nonprofits help to fill the roles that would traditionally fall under a government’s purview. Now, what is this GiveOrcas campaign? Well, with all of these nonprofits it’s to be expected that the Community Foundation receives a high number of requests for funding, and they simply do not have the capacity to cover the full needs of every organization. So yes, it is essentially a fundraiser. However, this particular fundraiser is as much about creating awareness as creating cash. For at the public’s fingertips is placed an insight into what each organization is hoping to get funding for; whether it be a specific project, program, or for staffing needs. These needs are then arranged, by OICF, into three categories: Critical Needs, Important Needs, and Opportunities. This allows for members of the community to decide where they want their donated funds to go, based on their own individual ideals. And, given that Orcas is a community that likes to support one another, most of these needs are met during this time. The GiveOrcas campaign runs through May 19th this year with an Awards Celebration being held on Thursday, May 25th from 3-5pm at the Orcas Center. Posted July 8 2016, 11:00 AM PDT by Tara Sharp. Read the original here.